It controls the forward and backward balance while the rider balances left and right. It's a unique blend of machine and human balancing. The rider controls the speed by leaning forward or backward to speed up or stop. There is no need to pedal, in fact there are no crank arms, just foot rests. The SBU keeps upright by utilizing advanced electronics including accelerometers and gyroscopes with sophisticated balancing algorithms. The Self-Balancing Unicycle can move along at a top speed of eight miles per hour, and will operate for about 1.5 hours on a charge. It weighs about 25 pounds and costs about $1,500. Gaines and Harvey mounted tumblebugs, and kept abreast of the Cadet Captain, some twenty-five yards behind the leading wave. It had been a long time since the Chief Engineer had ridden one of these silly-looking little vehicles, and he felt awkward. A tumblebug does not give a man dignity, since it is about the size and shape of a kitchen stool, gyro-stabilized on a single wheel. 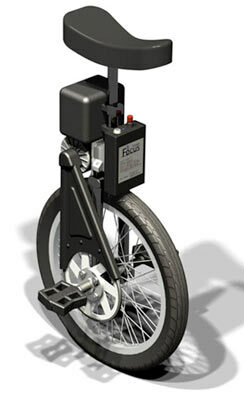 For other modern-day variations on this idea, see Tango Motorcycle Monocycle and the Eunicycle Single-Wheel Gyro-Stabilized Scooter. From Focus Designs via Gearlog.